Sony Computer Entertainment Europe (SCEE) recently unveiled Slimmer, Lighter PS3 with streamlined form factor.The new PS3 from Sony will be available in India by last week of November with a price tag of Rs. 19,990/-. The new Playstation features comes with a with a 120 GB Hard Disk Drive (HDD).The whole internal system has been redesigned to attain the new lighter and much slimmer model.When compared to the very first PS3 model now the volume of the new PS3 reduced to approximately two-thirds and power consumption reduced to two-thirds. 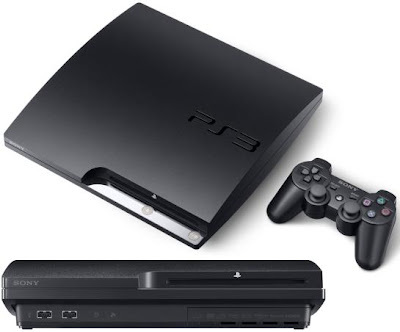 Sony PS3 system India price Rs. 19,990/-. *Audio output - LPCM 7.1 channel, Dolby Digital, Dolby Digital Plus, Dolby TrueHD, DTS, DTS-HD, AAC. Tags:-Sony PS3 system,Sony PS3 system new launch , Sony PS3 system in india , Sony PS3 system features, Sony PS3 system specifications, Sony PS3 system india launch ,Sony PS3 system india price, Sony PS3 system india price details, Slimmer PS3 from sony, Lighter PS3 from sony, Slimmer PS3 in india details, Sony Lighter PS3 india features, Sony Slimmer+Lighter PS3 india price.